More than three-quarters of consumers say that the most important element in website design is ease in finding what they want, according to recent research. 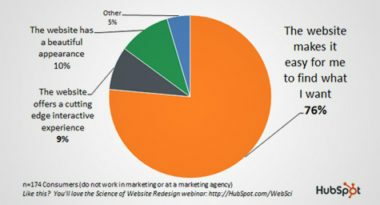 Hubspot.com revealed why this information matters to marketers. When developing a website, marketers should focus on consumer usability much more than visual presentation and “good looks.” Conversion rate should be the main concern, which is the result of people getting what they want out of your website. Forget about too much flash, lots of video or an abundance of graphics, but do use these features selectively if they enhance the site’s usability. Use a simple layout that is familiar and friendly to consumers rather than trying to be new and different. Overall, distinguish your website by making it easy to use, since that will determine its effectiveness and value. The best way to find out if it’s consumer friendly is to test it repeatedly on various people and see if they can quickly and easily get what they want from your site.